During a recent taping, BizVid partner Bill Gruber sat down with Roxanne Valanoti, National Educational Training Manager for Creative Nail Design, also known as CND. CND has been using video as a training tool on their website and on YouTube for a number of years. Roxanne has been the instructor on many of the videos we have produced for them and is a firm believer in the power of video on the web. Bill: Roxanne, let’s talk a little about CND’s involvement in web video and why you perceive it to be a valuable asset. Roxanne: The one thing about CND is at our core is education and we believe that you can’t educate what you don’t innovate. So video gives us a great staging ground to bring our education classes to the professional and non-professional right in their home. We’ve produced over two dozen sets of videos on technique, styles, trends, fashion, and it really helps to have the internet bring it right to the nail professionals home. Some professionals might not be able to get to a class or it might not be offered in their area, so video really does help us reach a large amount of people. Bill: And the videos are detailed enough that they really do train, correct? Roxanne: Absolutely and that’s the great thing about video, you can stop, you can pause, and you can watch each step over and over again. Bill: What kind of feedback to get? Roxanne: Of course with YouTube you can measure how many views you get, but nail professionals love it and they want more and more videos. They don’t want to sit in a class environment anymore. With technology today, they want it now and they want it fast. Bill: Roxanne Valanoti, thanks for joining us today. As BizVid Communications prepares for an upcoming Carlsbad Chamber of Commerce teaching session, we’ll be instructing on how businessmen and women can produce their own web videos. Some internet facts have come across our desks, which we would like to share with you. Even a casual web observer cannot deny the power and attention-grabbing impact found through videos placed on the internet. Statistically, many small businesses are getting the message. A leading internet publisher and research organization, comScore, reports in it’s Digital Year in Review that 179 million Americans watched online video each month during 2010 and that more than 88.6 million people watched online videos on an average day in December 2010. This statistic was an increase of 32% over an earlier, similar timeframe. But, more remarkable facts abound. According to a recent report published on eMarketer, the US online video audience is expected to grow to 190 million people by 2012. That’s 88% of the entire online audience. In fact 54% of internet traffic is now video-related and websites with video hold attention an estimated ten times longer than text-driven sites. Did you get that, ten times longer? 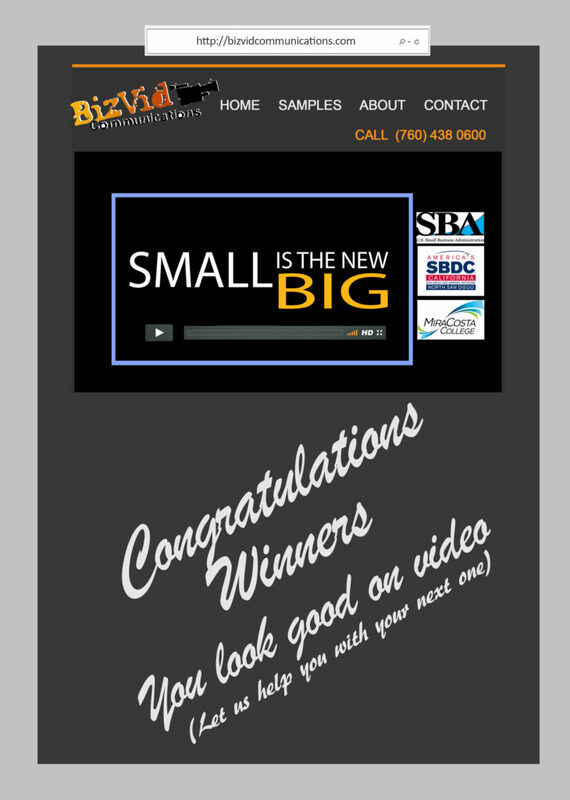 In a recent SBA Radio program which we produce, we spent an entire segment giving tips on building your own web video. Listen to it by clicking here. Ask yourself how much money you’ve invested in your website, Next, realize that well placed videos within your web pages will significantly multiply the value of your investment. And, don’t say you have nothing to talk about. Consider product introductions, service benefits, simple welcome messages, video press releases, lecture archiving, investor support, FAQs, and the list goes on and on. The cost effectiveness of producing and displaying video may pleasantly surprise you. At BizVid Communications, we say that it is not a big budget, but a BIG IDEA, which makes a video stand out. What’s your big idea, which separates you from others? Put it in a video. Look for additional blogs on our video production sessions, coming soon to a computer screen near you.